I liked the fact that it is a small size and still gets rid of the clutter and still makes it accessible. Nice color and an attractive pattern. I would recommend it to anyone who needs an auto trash bag. Use these pretty and washable bags in your car to keep the trash in one place. Simply attach to a handle, or hang from the back of the headrest for easy reaching. It's made from durable cotton canvas and is lined. To keep it clean, simply wipe down with cloth wet with water and a mild soap. 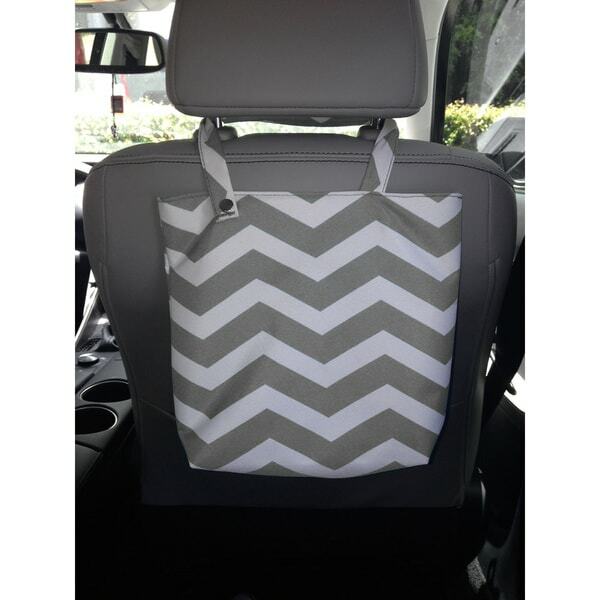 Your choice of Black, Aqua, Gray, Green, or Red Chevron Design. Some of our friends use one color for trash and another for their kids' toys!! Cute little trash bag. Very convenient for the kids in the back and keeps my floorboard clean! Purchased this a while back and have moved it from one vehicle to another when I purchased my new car. It is small but convenient. Keeps the trash off the car floorboards. Really comes in handy with a 7 year old in the back seat. Trash used to end up on the floor but now he actually picks up after himself. I'd buy another one but they really aren't very big for the price. My favorite trash bag for my suv. It’s stylish and easy to clean. THIS AUTO TRASH BAG IS VERY WELL MADE SEEMS LIE IT WILL BE DURABLE ENOUGH TO HOLD EVEN HEAVIER ITEMS, THE ONLY DRAW BACK IS THAT IS IS MUCH SMALLER THAN IT APPEARS IN THE PICTURE, MAKE SURE TO READ THE SPECS ON IT SO YOU ARE AWARE OF THE ACTUAL SIZE. We received this item in a timely fashion after ordering. Upon receiving the trash bag, the package was extremely light. The picture with the description listed on the site seems to be misleading. The bag isn't as large as it seems to be in the picture. Search out dimensions before ordering if you're looking for a larger tote sized trash bag for your vehicle. Smallish bag that does fit over the headrest of my car. The bag is lined with a moisture barrier for spills. MUCH smaller than in the picture but overall the quality seems OK. About the size of a paperback novel. I'm disappointed it won't hold much trash or etc. but I can use it as a cell phone and wallet holder. I love having these. My two and three year olds were very excited as well! The quality is better than expected for the price. There is a nice liner inside. I went off the picture and did not read dimensions so they are a bit smaller than I expected. Don’t buy it! It looks nothing like it looks in the picture, is incredibly small and made of cheap materials. I definitely wouldn’t repurchase this. Is a lot smaller than shown. daughter bought new car and thought this would be a nice gift.